Special Counsel Robert Mueller’s indictment of 13 Russian nationals on Friday confirms Russia sought to promote anti-Trump protests after the election as a way of sowing discord in American society. Facebook ads turned over to the House Intelligence Committee last year showed that more than 16,000 people RSVP’d as attending the protest. The indictment notes that the operatives organized a pro-Trump rally in New York the same day as the anti-Trump rally, although there is no indication that the pro-Trump rally was as successful as the anti-Trump rally, which had thousands of attendees, including left-wing filmmaker Michael Moore. The Guardian reported 10,000 attendees at the anti-Trump event. The Russian operatives staged a similar anti-Trump rally, “Charlotte Against Trump,” a week later in Charlotte, North Carolina. The Russian operatives sought to “promote discord in the United States and undermine confidence in democracy” by organizing the protests, Deputy Attorney General Rod Rosenstein said Friday. Mueller’s indictment confirms what legal representatives for both Facebook and Twitter told a Senate panel on Oct. 31 last year: that Russian operatives sought to harm America by undermining public confidence in President Trump’s election. Facebook general counsel Colin Stretch said that Russian operatives, after attacking Democratic nominee Hillary Clinton during the election, switched to “fomenting discord about the validity of [Trump’s] election” immediately after he won. Both Stretch and Twitter general counsel Sean Edgett described it as “accurate” that the Russians were “trying to undermine President Trump’s legitimacy” after the election. Russian operatives also sought to promote the left-wing identity politics that currently dominate the Democratic Party, previous reporting has shown. One Russian account promoted a militant, left-wing form of feminism, similar to the kind pushed by Women’s March organizers. The Russian operatives behind the account fooled Women’s March organizers into sharing their divisive propaganda on Facebook, as TheDC first reported. Several Russian accounts posed as racial activist groups similar to Black Lives Matter. 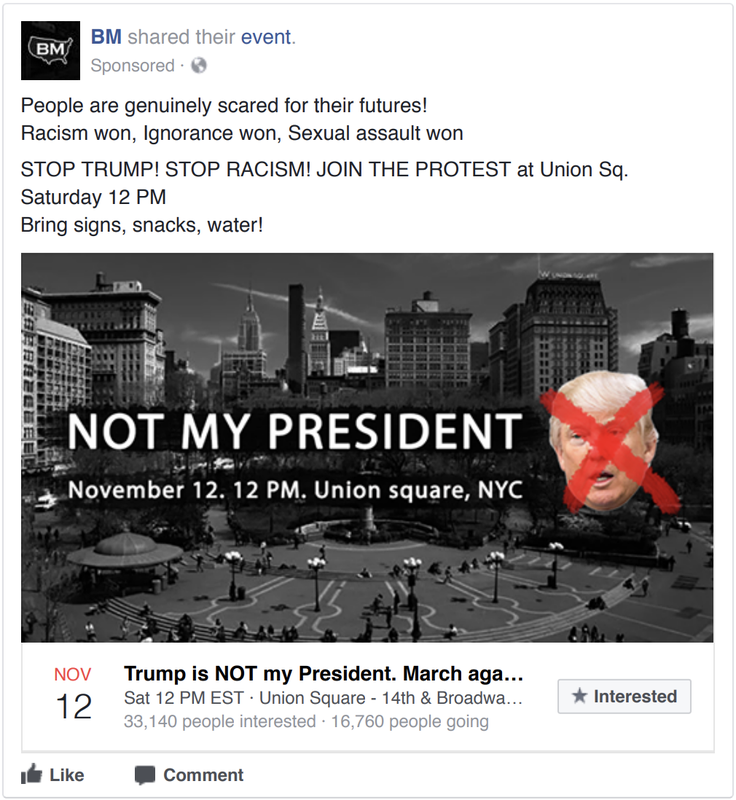 One of those pages, Black Matters, organized the Nov. 12 anti-Trump protest attended by Michael Moore and thousands of other protesters. Another page, Blacktivist, had a bigger Facebook reach than the official Black Lives Matter Facebook account by the time it was shut down. Blacktivist accounts frequently stoked racial outrage about police shootings and mass incarceration of black men.